In the back garden it’s roses that are in bloom. 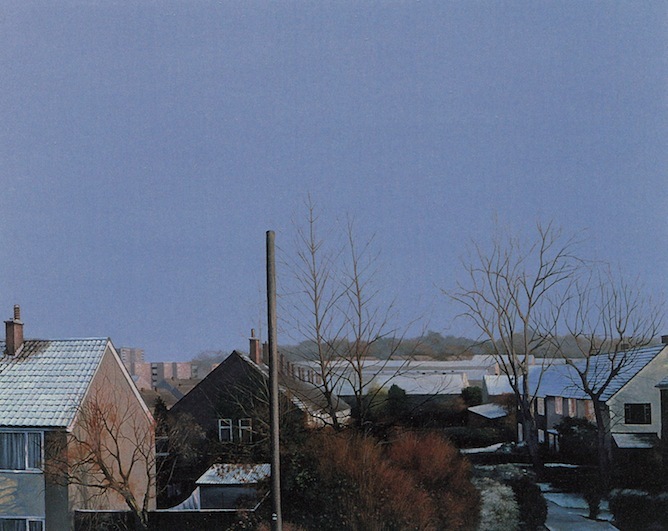 Which I suppose means that the artist based this set of paintings on photographs taken at different times of the year, perhaps even in different years. But in any case, photographs that could be turned into paintings full of a lace-curtain privacy and suburban homeliness. 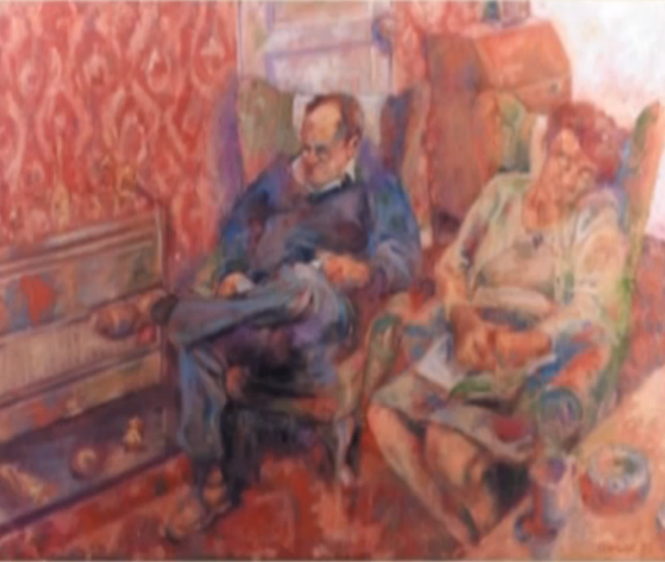 Of the ten paintings in the series, six are interiors. 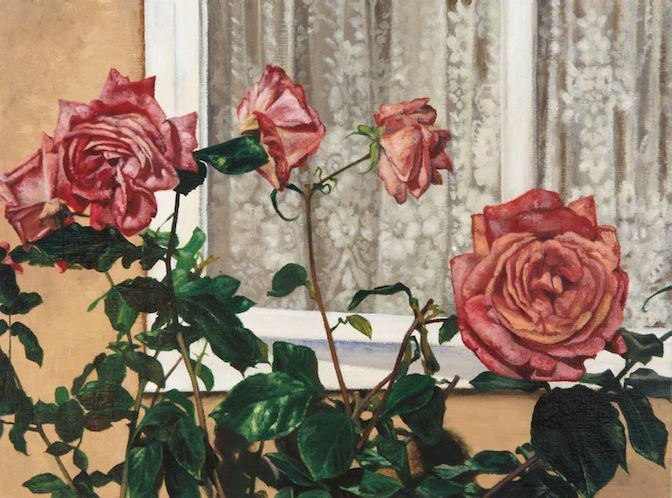 But see, below, how the pink roses have followed Shaw inside the house in the form of the wallpaper pattern. See too that there is a more sombre, autumnal feeling to the carpet in the hall. Yes, the Forest of Arden has also followed George inside number 57. 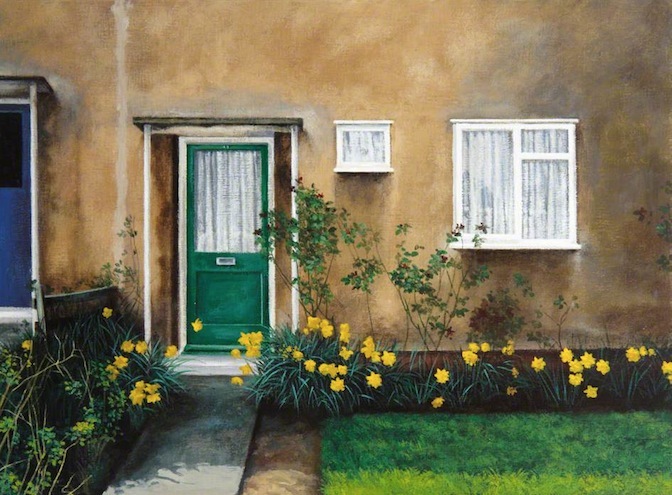 I don’t think the individual paintings in the series have got titles, certainly they don’t on the BBC ‘Your Paintings’ site that these images were taken from. 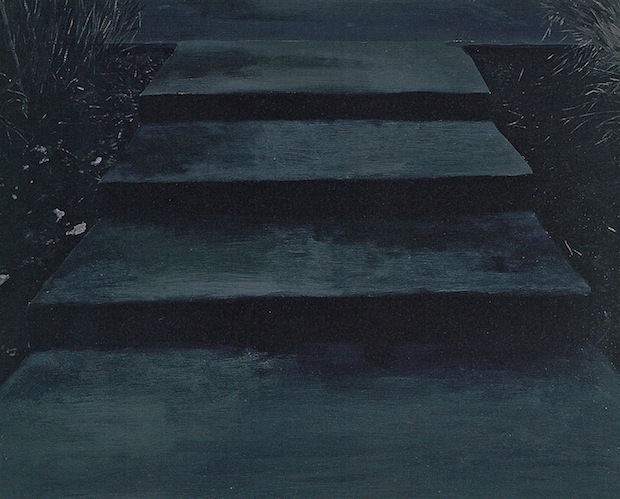 The painting below could, I like to suppose, be called The Path In. The paintings don’t show anything too personal. Shaw bedrooms and the Shaw living room are avoided altogether. 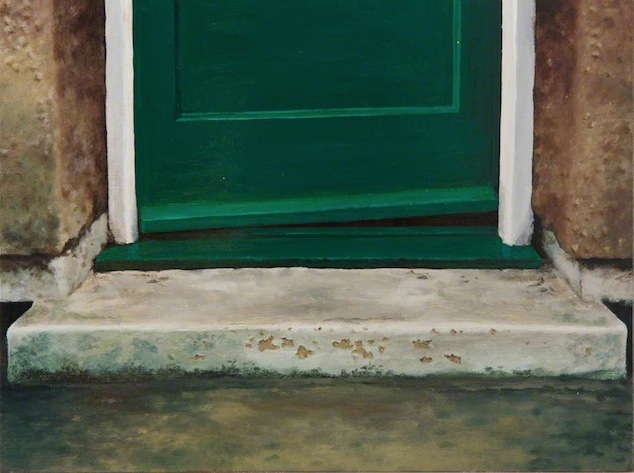 I suppose the paintings provide a more general invitation to the viewer. 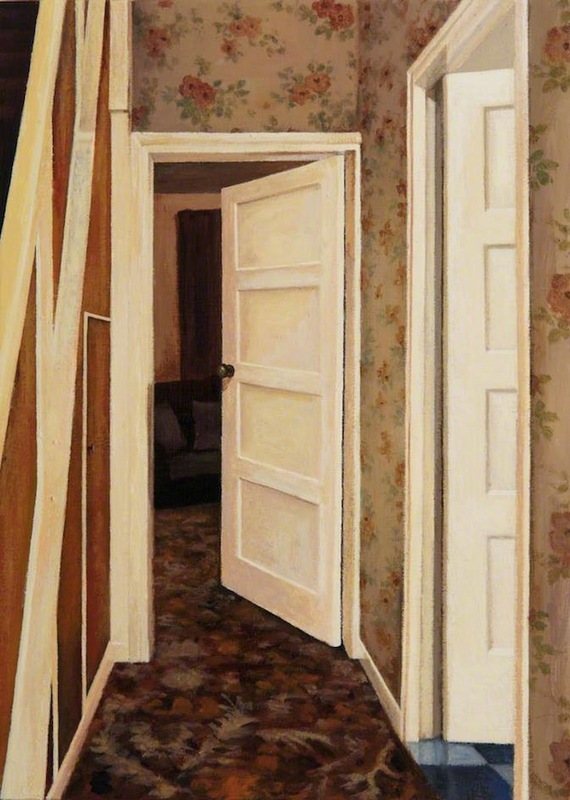 What we have at our disposal are open doors and corridors full of post-War hope. In other words, you can stand looking out of the window of the hospital, thinking of where you’d like to be. 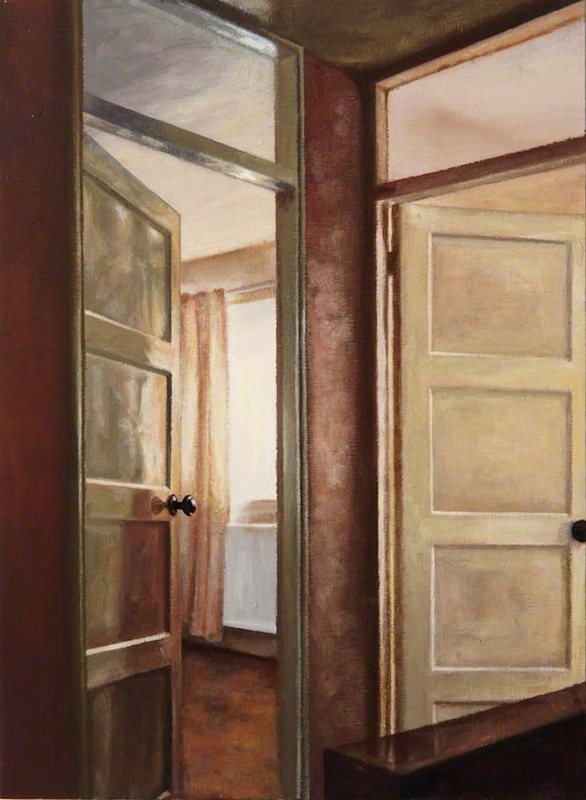 Or you can sit on the window seat and turn your head to look at a painting by George Shaw of the place he might think of if he were in hospital. I’ll explain the above lines further down this page. 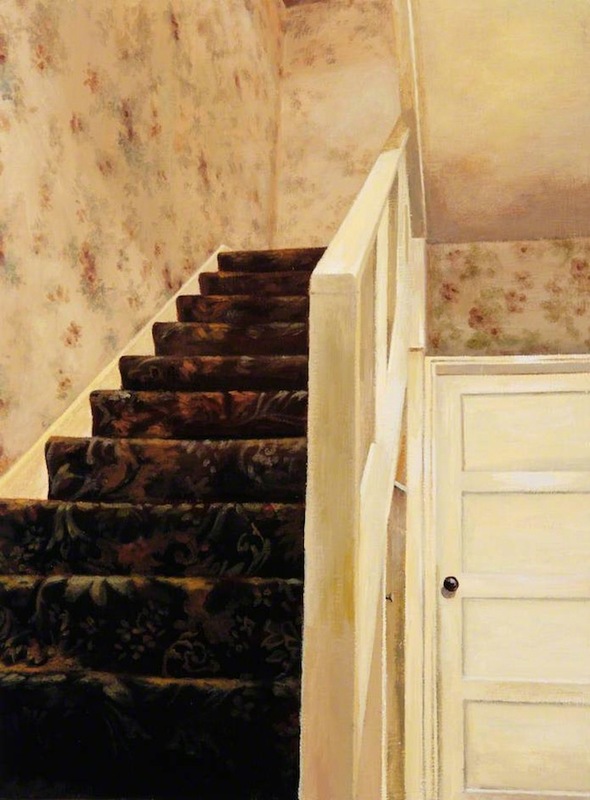 The painting directly below is not part of the ‘Home’ series. Google has confirmed that it’s the view from George’s bedroom in the house he grew up in. I figured it might be, because the view-point is from well-above ground level. As you can see from the photo below, the Google view of the same scene is from street level, from where the composition is messier. Returning to the view from George’s bedroom, one begins to get into it. A pellucid sky... Some reassuring horizontals... Plenty of upward pointing spire-substitutes - gable ends and chimney pots. Plus the aspirational telephone pole. 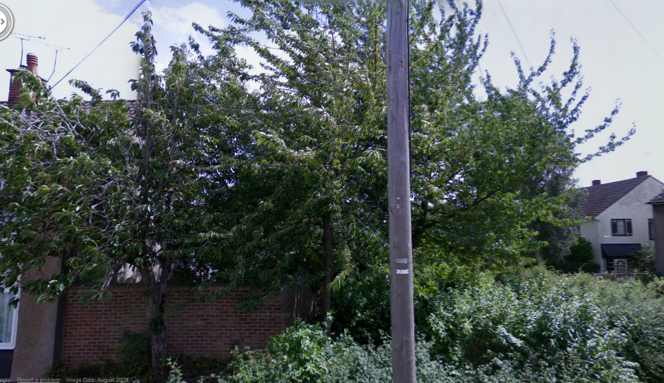 Perhaps it was the fortuitous location of this pole that inspired George through his early interest in art, and which meant that he would never settle for less than a full-blooded long-term project: ‘set the controls for the heart of the sun!’. The painting below, The Very Sad Tree, is from 2004. I thought it might be a tribute to Dennis Potter, champion of a left-wing, working class sensibility. 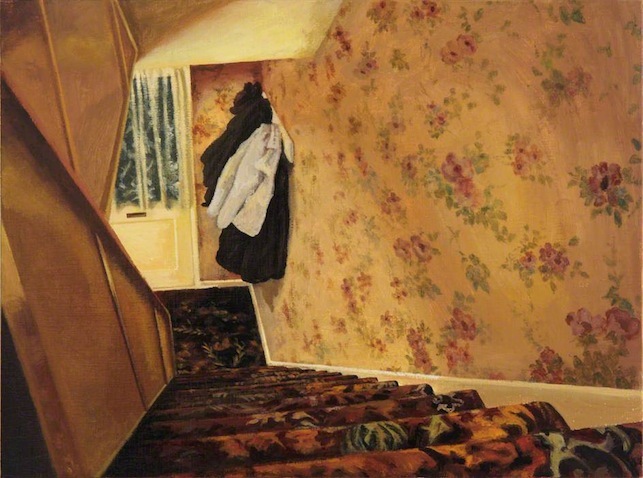 Then I thought the 2001 painting - above - was more likely to be a tribute, as the blossom quote was made just a month or so before the writer’s death. At this point I looked up Dennis Potter on Wikipedia and discovered that he died back in 1994. Dennis Potter has been dead for nearly twenty years! Worse, The Singing Detective, was made nearly thirty years ago! Actually, I’ve already mentioned Morrissey on this page, as the ‘winter’ lines quoted above are the spoken intro to his ‘Late Night, Maudlin Street’, a favourite track of George Shaw’s, as it happens. It’s the longest song on Viva Hate, which came out in 1988, just a couple of years after George had stopped living at number 57. You might want to listen to it as you read, in which case try this. Took some stick here? How could it not be so - four Shaw children raised in a relatively small house. Two boys sharing a bedroom. The parents would have needed rules to keep discipline in the house. 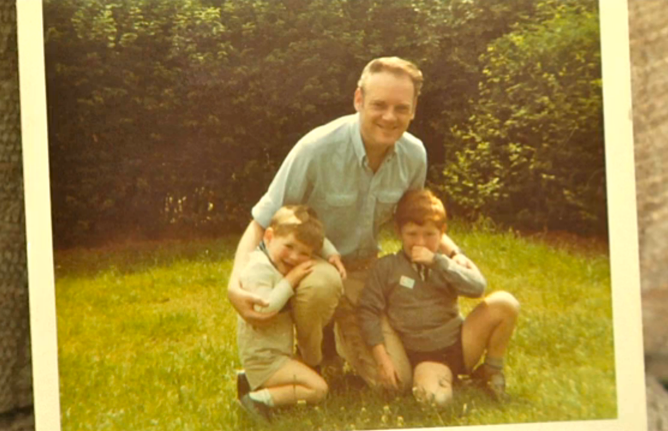 And George Shaw, being a wild child, would have broken those rules. George senior: “I’m asking you not to dive through the hedge, George. First, it means you’re invading someone else’s back garden. Second, it sets a bad example to your brother. Third, you’ll fall in with the rude mechanicals who make up that Midsummer Night’s Dream crowd. Still from ‘I Woz Ere’, 2011, a film by Jim Turner for Herbert Media. Still from I Woz Ere, 2011, a film by Jim Turner for Herbert Media. 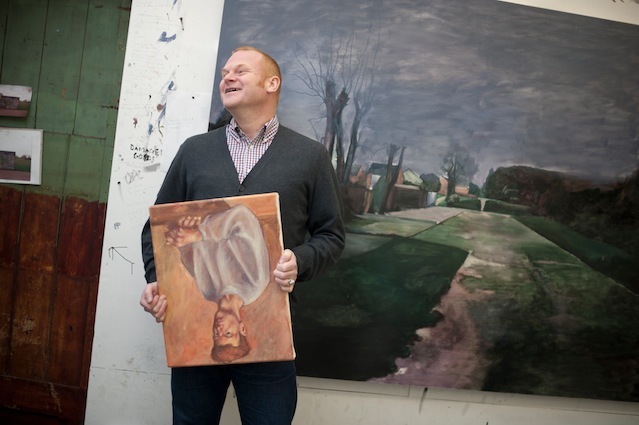 Studio portrait of George Shaw taken by Jim Wiseman, 2011. Talking of complaining, I’ve got a complaint. The ‘Home’ series doesn’t let us see into the lounge of the Shaw household. 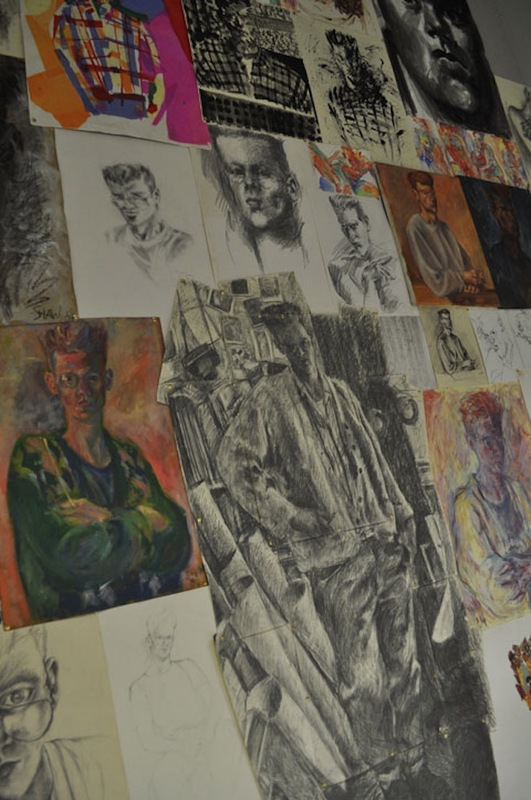 That portrait of DH Lawrence by George’s Uncle Mick - where is it? 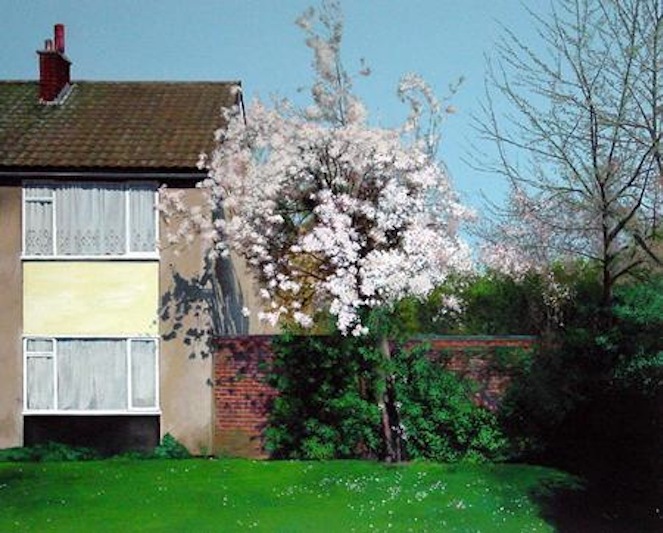 However, the Channel 4 documentary, The Late George Shaw, made in 2004, includes a shot of the painting below, which I take to be George’s parents sitting in the front room of number 57. Actually, I’m glad Uncle Mick’s picture isn’t shown and that the image is indistinct. We’re getting close to the heart of the Shaw household now and some distance needs to be kept. Some secrets should remain out of sight. 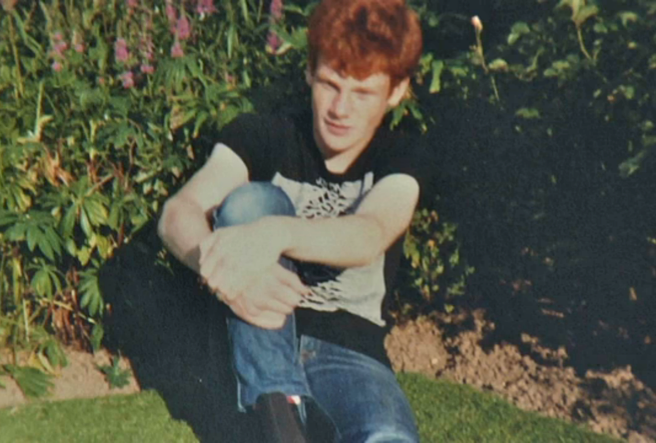 George packed in 1984, when he was 18. Off to Sheffield and art college. Inspector - don't you know ? Well, it's only bricks and mortar! I thought I should try and work out what motif George was alluding to but without much hope that I’d succeed. After all, it took me ten years to link the pointing finger with the finger of God creating Adam. Anyway, here goes. The song is called ‘I Keep Mine Hidden’. The words contrast the character of the singer, who hides his feelings, with the character of another, whose emotions spill out. But what is the motif? Is George simply acknowledging that his work disguises a lot of the experience and emotions that lie behind it? Or is there something specifically visual he’s flagging up? I remember stumbling back to my own home after the odd drunken night out in my youth. Following a flight of steps, there was the one final stumbling block that took one over the threshold of 1 Bulbourne Close and into the safety of the home made for me by loving parents. But, you know, no-one stays up for you. I had sixteen pints all around my head. 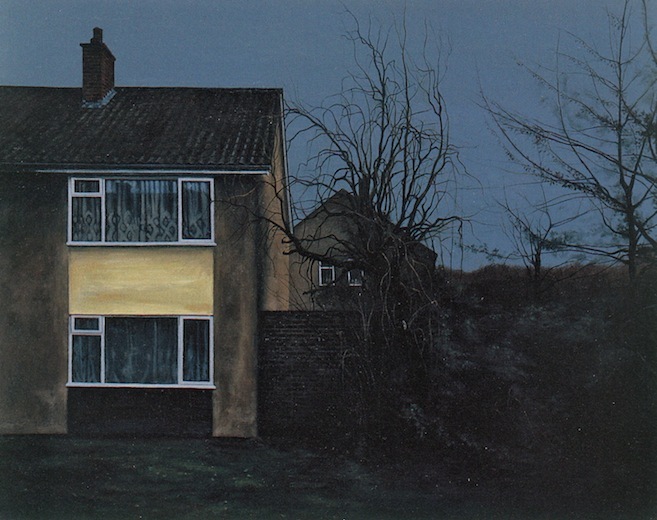 Acknowledgments: The images of George Shaw’s works on this site are copyright the artist. Many of them appear courtesy of Wilkinson Gallery, photography by Peter White. 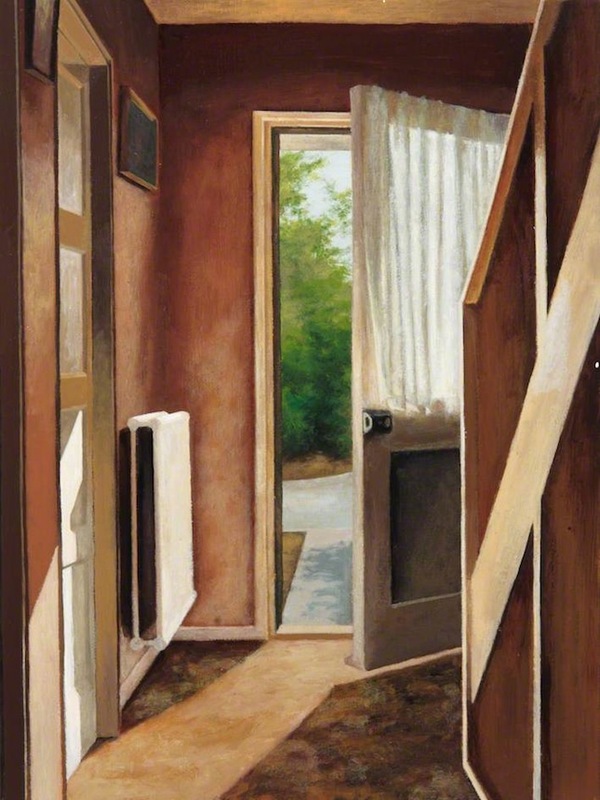 Images of the ‘Home’ series were taken from the BBC website, part of the Your Paintings in partnership with PCF (Public Catalogue Foundation). 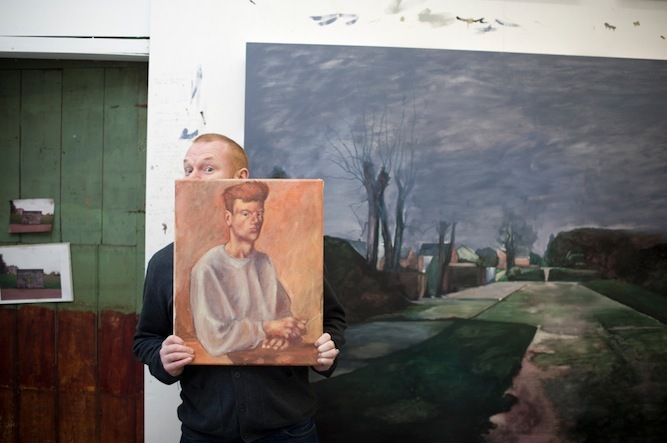 The studio portraits of George Shaw were taken by Jim Wiseman during a shoot for the Observer Review supplement in 2011. More photos from the shoot can be seen here. The lyrics to ‘Late Night Maudlin Street’ are the copyright of Morrissey, as far as I know. If he, or any copyright holder, wishes a more formal credit, or for an image, or words, to be removed from this page, then they should contact me and I will adjust things accordingly.